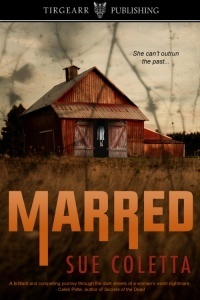 Shelley chose to read and review Marred by Sue Coletta. Sage and Niko Quintano move from Boston to a small town in New Hampshire in an attempt to start over following a brutal attack on Sage three years ago. The attack resulted in a miscarriage for Sage, physical scars, and a ton of emotional damage. Her husband, Niko, who is the sheriff, sustained a bullet to the shoulder but is also suffering from the emotional after-effects of that night. Unfortunately, trouble follows them to New Hampshire, and it is Niko’s job to keep Sage, and the town, safe from a sadistic killer. Coletta writes a fast-paced mystery with a host of unique characters. I like Sage; you get a true sense of what she went through at the hands of a madman, although there were times I threw my hands in the air and shouted at her to seek help from her law enforcement husband! Frankie is the deputy sheriff, and I loved her spark, she is a fun character and one I’d like to see evolved more in future novels. The addition of four-legged characters in the book also adds a certain homely charm. You will be kept guessing until the end. Coletta excels at adding plenty of twists and turns to ensure you can’t put the book down. It picks up the pace the more you read until you arrive at an explosive conclusion. Sounds very interesting. Thanks, Shelley. Thank you, Linda. That’s very kind of you.